Both programs train individuals to take monthly water samples at adopted sites, analyze the samples, and input their readings in an online database. Not only can they see the results in real-time, but the data is given to local resource managers to fill a gap where county or state monitoring does not exist. Lisa Krimsky, Florida Sea Grant agent with UF/IFAS Extension in Miami-Dade County, has developed Biscayne Bay Water Watch to raise awareness about harmful algal blooms and other water quality issues in the Bay and surrounding waters. “We needed a way to help educate the public about the issues and the concerns regarding Biscayne Bay,” said Krimsky. She added that it also meets the needs of helping to monitor water quality in areas that are no longer being monitored in the county due to reductions in funding. Further south in the Florida Keys, Shelly Krueger, Florida Sea Grant agent with UF/IFAS Extension in Monroe County, is developing a similar program, Florida Keys Water Watch. Her program monitors residential canals, most of which were dug in the 1950s and 1960s to provide waterfront living for a growing population. The canals were built in such a way that water circulation was obstructed, posing a threat to marine life and causing other long-term environmental impacts. “Several years ago, Monroe County completed the Monroe County Canal management plan and after surveying more than 500 canals, they found that about a third of them were in a state of what they called poor water quality based on low dissolved oxygen,” Krueger said. 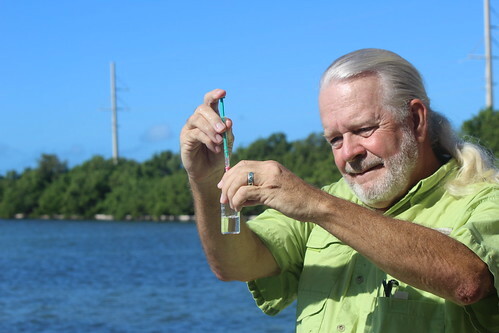 Walt Fahey collects a water sample from his neighborhood boat basin in the Florida Keys. He uses the data to educate other homeowners about water quality and to encourage them to help keep it healthy. She takes the data collected by the volunteers and presents it to the Environmental Protection Agency and the Monroe County Board of Commissioners. “With the data, they can see what’s happening in the nearshore waters because ultimately these nearshore waters are adjacent to the third largest coral reef in the world,” she said. Both programs are actively seeking volunteers. Walt Fahey, a retired dentist and resident of Marathon Key, uses the data he collects to inform citizens in his neighborhood about best practices for keeping their boat basin clean. He also added that although he has a science background, you do not need one to become a volunteer. As part of the program, Krimsky and Krueger provide a four-hour training that explains each step of the testing process. Krimsky said that although her program requires access to a boat, since the sites are located at various sites along the Bay, there are still other ways to volunteer in Miami.